Bruce Dawson has an excellent article “Xperf Wait Analysis–Finding Idle Time” which explains how to use Windows Performance Toolkit (WPT) to analyze CPU idle issue. He actually has a series of articles about WPT and I would recommend read all of them if you are new to WPT. Container Init Time: this starts when the service process being created by services.exe, ends when the service process calls StartServiceCtrlDispatcher; if there are multiple services sharing same host process, Container Init Time will only be counted for the first service. Service Init Time: this starts when ServiceMain was called, ends when service called SetServiceStatus with status SERVICE_RUNNING. Duration: this is how long service took to start, the value came from “Ended At” minus “Started At”, or “Container Init Time” plus “Service Init Time”. From the table, we can see that MyService did take 1.079s to start, most of the time was spent in Container Init Time, this means we should make our focus on looking at what the process did at its start up. Fortunately the etl file has ReadyThead (please see this article for details) information and stack-walking was enabled on it, let’s try to find out what is its first thread and what it did. Again, please see this article for information about the meaning of these columns. 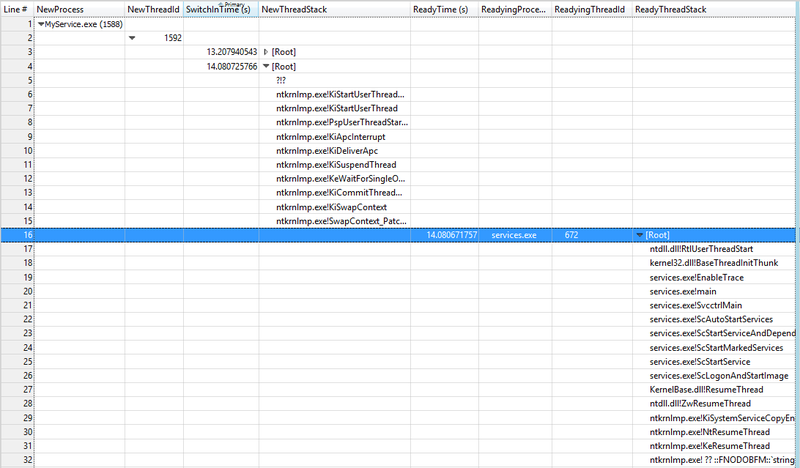 From the graph above, thread 672 in services.exe is the readying thread of thread 1592. 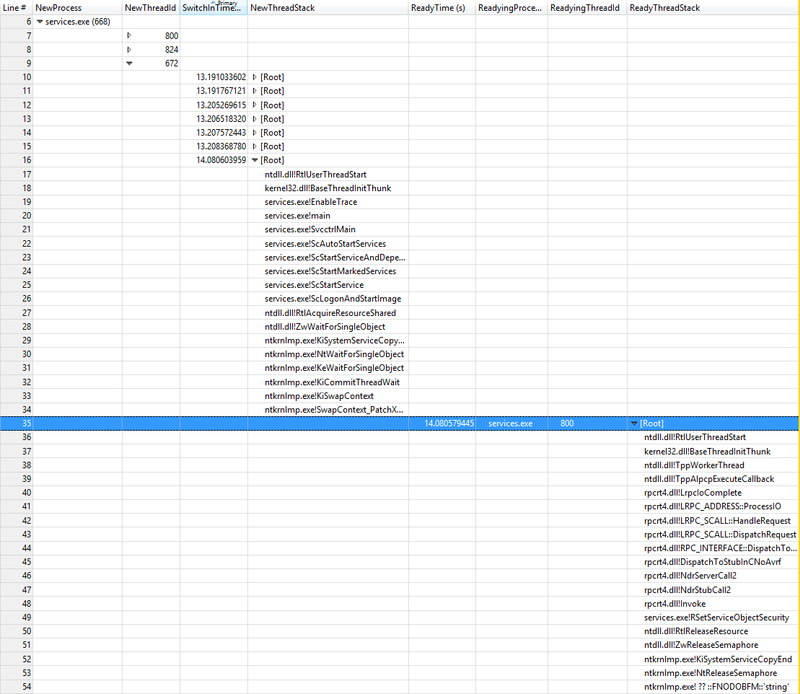 Also from the stack, we can tell that services.exe created thread 1592 (in suspended status) at around 13.207940543s, but didn’t call ResumeThread to let it run until at about 14.080671757s (column ReadyTime(s) in the graph), was it blocked too? Let’s take a look at what’s happening in thread 672 of services.exe. 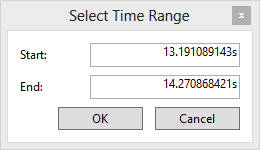 It looks actually pretty normal, the switch in time here was distributed evenly without any noticeable gap from 13.20s all the way down to 14.08s. It looks like a dead end. Or is it? This is cool. 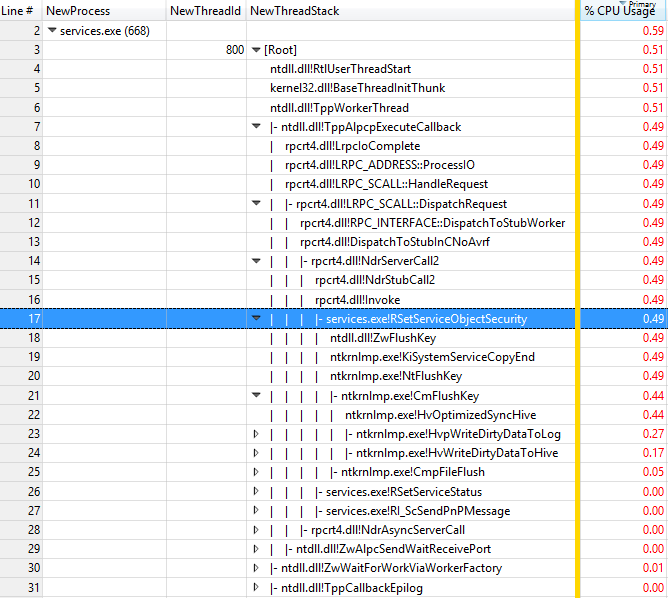 The butterfly stack graph shows that during 13.20s to 14.08s, in thread 800, most of CPU time was spent in function services.exe!RSetServiceObjectSecurity and children functions called by it. Based on stack, we also know that thread 800 was responding to an ALPC message and was modifying a service’s security descriptor. As the result of the modification, it resulted a registry flush which took about 0.8s to finish. This whole process was inside a semaphore object (recall that thread 800 readied thread 672 by calling ntkrnlmp.exe!NtReleaseSemaphore from services.exe!RSetServiceObjectSecurity), which ultimately delayed start of MyService. 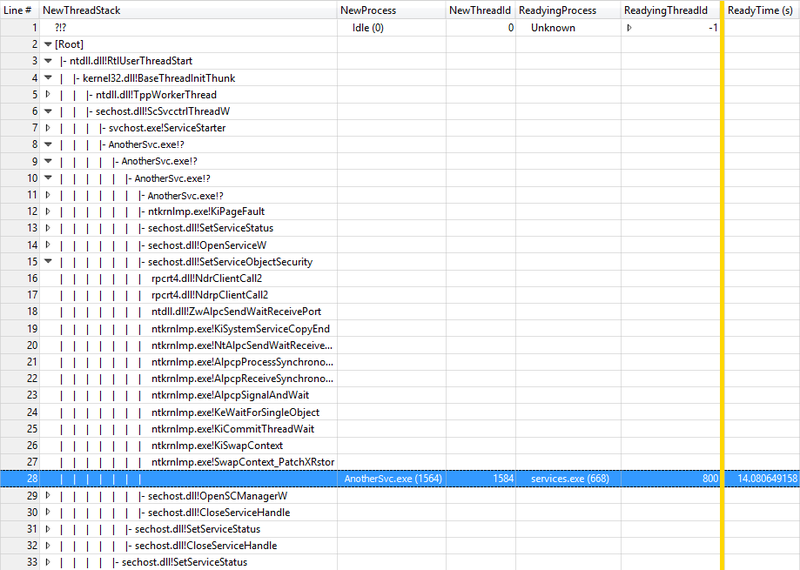 AnotherSvc.exe’s thread 1584 made a call to sechost.dll!SetServiceObjectSecurity, it transformed into an ALPC message, handled by thread 800 in services.exe, and once it is done, thread 800 readied thread 1584 as well as another thread 672 in services.exe almost at same time due to the releasing semaphore. Now all the pieces are put together and we got a clear picture of what was going on. I contacted the team responsible for AnotherSvc.exe and they fixed the issue by moving the call to sechost.dll!SetServiceObjectSecurity at a later stage. 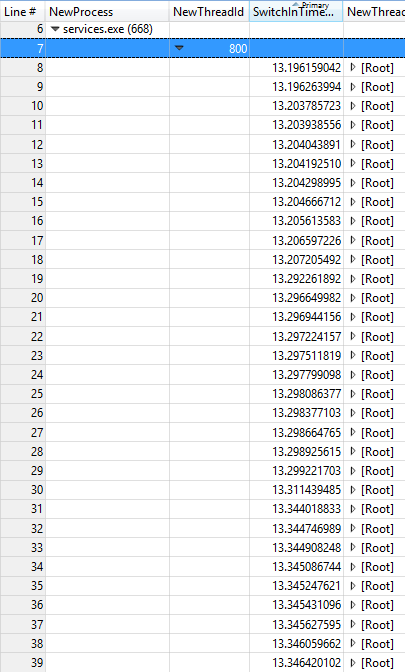 Here we used ReadyThread table (and different columns and orderings) to track down the root cause of the service slow start, across 4 threads in 3 different processes, this is so far the most complicated slow performance issue I have met, and I hope won’t run into another in future. Posted on May 10, 2013, in performance, wpt, xperf. Bookmark the permalink. Leave a comment.